The Makings of "Aunty Betty"
It's not often that you can follow a "making of" while it's being made. 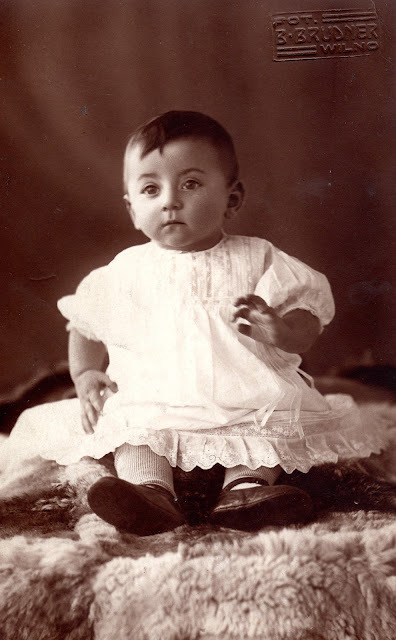 This weblog intends to allow those interested to follow the progress on the documentary which I'm making on the life of my Aunty Betty, the last in the family to cross the threshold between the Old World and the modern Jewish diaspora. One would almost think that the most ugly events tend to happen in the most beautiful places. 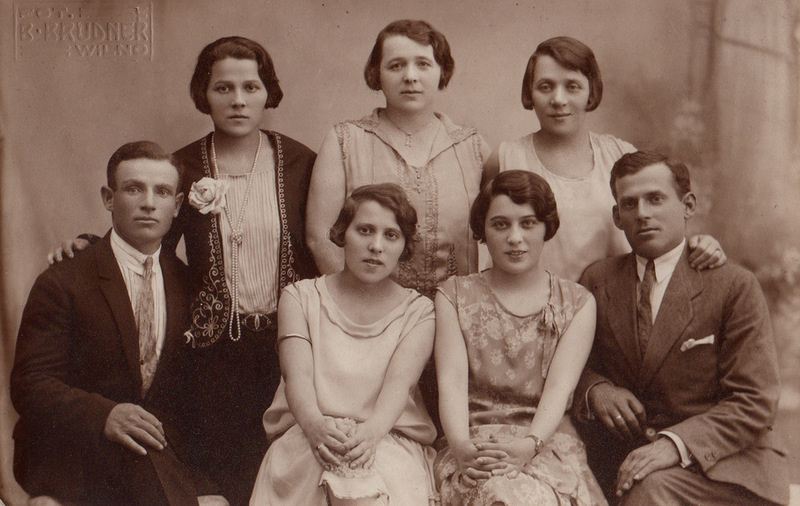 Aunty Betty's niece, Basia Daiches, was taken from the Vilna Ghetto to the Nazi labour camp Klooga in Estonia. Klooga is ironically situated in one of the most idyllic spots I've ever been. Before the Second World War it was a recreational area for the residents of Tallinn, the capital of Estonia, as indeed was Ponar for the residents of Vilna. In January 1943, when Hitler was forced to give up his dream of taking the oil fields of Azerbaijan, he was looking for new sources of energy for the German war effort. One of the solutions was to breathe new life into the Estonian shale oil industry . A network of labour camps was set up in east Estonia for this and other purposes related to the war effort. 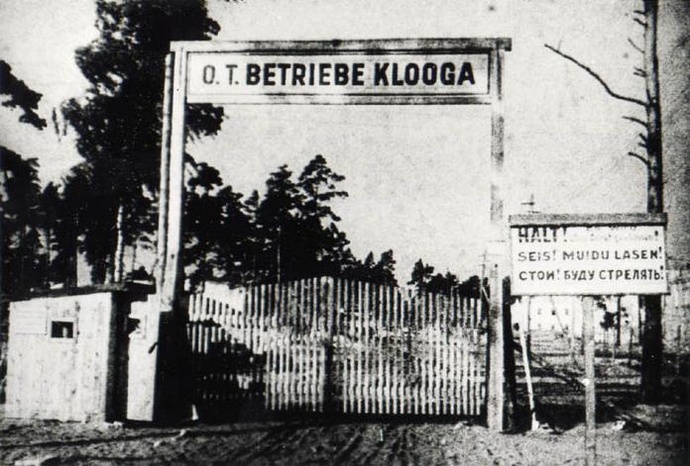 The camp at Klooga (pronounced kloga) was established in the summer of 1942 in the west of Estonia, about 40 kilometres from Tallinn. 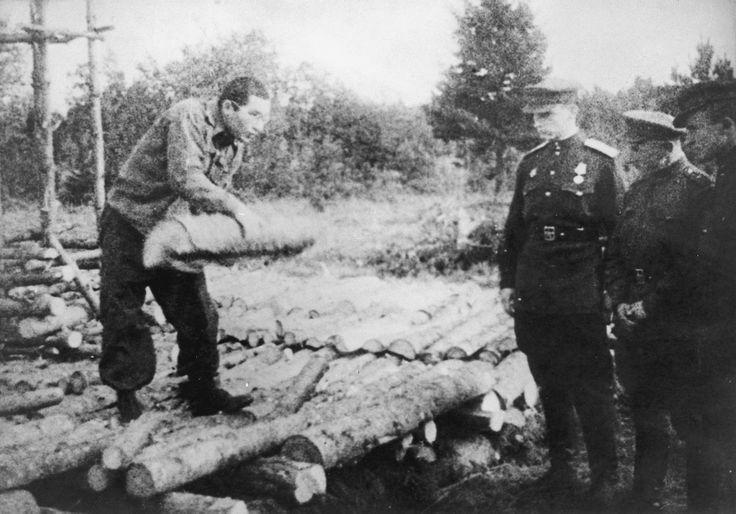 In the beginning the camp was used for about 100 Soviet POWs. In September 1943 the first Jewish prisoners arrived, mainly from the Vilna Ghetto and by 12th May 1944 there were 2000 Jewish inmates, 1200 men and 800 women . At the Estonian Jewish Museum in Tallinn we were kindly shown around the exhibition by Avi Dobrysh, member of the Board of the Jewish Community of Estonian and President of Maccabi Estonia. He told us the fascinating story of the Jews of Estonia, for me a new and interesting piece in the puzzle of the Jewish Diaspora. 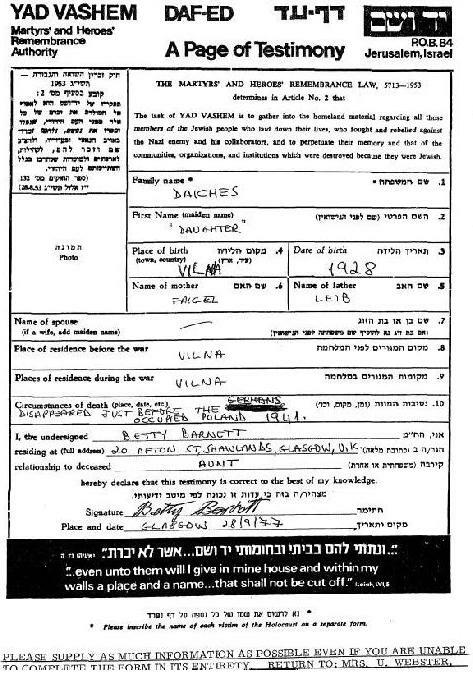 In 1977 Aunty Betty submitted a testimony to Yad Vashem for her missing sisters, brother-in-laws and nieces (see also 'New information on Betty's nieces'). After 36 years she still did not know what had happened to them. In her testimony she wrote "disappeared when the Germans occupied Poland 1941"[+]. Thanks to the age of internet it is possible to look up records scattered all over the globe within a matter of minutes. In this way I discovered Betty's niece, Basia Daiches, amongst the list of prisoners of the Klooga Nazi labour camp. This list was compiled by Avi Dobrysh from the original camp card-trays which are now stored in the depot of the Estonian State Archives. If it wasn't for his efforts, for which I personally am grateful, Basia's trail would have ended at the Vilna Ghetto and this significant part of her story would never have been told. Turning to the subject of the Klooga camp, Avi then began to tell us of its history. Compared to other camps in Germany or Poland the regime in Klooga was less harsh. This still however entailed rations on which one could barely survive, forced labour, the humiliation and regular beatings of camp inmates, summary executions when camp rules were broken and even throttling and burning of new born babies . In the Estonian State Archives I was kindly given access to the records of the prisoners who were kept at Klooga. Basia's card was there, filed neatly under the 'D' for Daiches. Ironically this piece of paper, the back of a halved postcard, in an archive in the northernmost Baltic state, is the closest I have come in the search for my family in Lithuania. I have not been able to find records of other family members who might have accompanied her. The harsh conclusion is that she had already lost her parents and sister to the execution pits of Ponar and that she, a mere 16 year-old, travelled alone to Estonia. 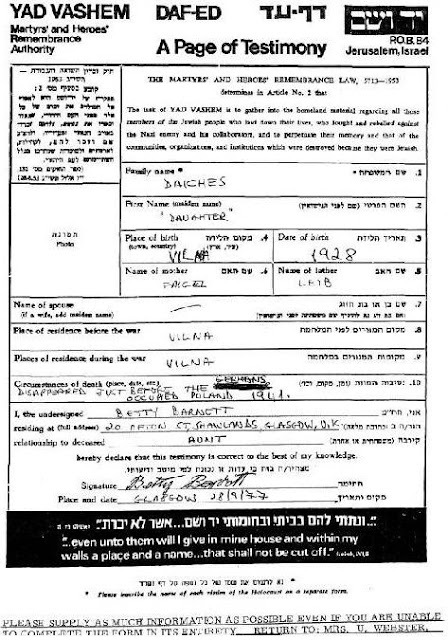 The camp registration card shows that Basia was consigned to the concrete department. This was one of the toughest places to work in the whole camp. Herman Kruk, who ultimately died at Klooga, described the regime at the concrete factory in his diary: "Concrete is no play; work in Concrete is the hardest work in Klooga, penal hard labor even for the Klooga inmates. If they need to punish somebody, they send him to work in Concrete. It is as hard to get out of working at Concrete as it is to split the Red Sea" . They worked from 6 a.m. to 12 p.m. and after a 'lunch' break of an hour from 1 p.m. to 6 p.m. . The concrete factory produced concrete blocks for constructing various military objects for the German war effort. At the Estonian State Archives my wife and I looked through the records of prisoners who were exempted from roll call due to illness or who had died through illness. Basia was not among them. Nor was she mentioned in the records of prisoners who for whatever reason had been shot. This leads to the tentative conclusion that she was in all likelihood amongst those who were massacred on 19th September 1944. In the morning of 19th September 1944 roll call was done at 5 a.m. as usual. However two hours later 300 men were selected to carry logs to a glade in the forest 700 metres to the north of the camp. By noon the prisoners were still in the roll-call square, now sitting and aware of the trucks which were barricading the camp gates and the automatic machine gun which had been placed near the barracks. Anxiety among the prisoners began to rise. The kitchen staff however were ordered to make an unusually good soup for the inmates and this calmed the prisoners to an extent. They were told that there was also soup for the workers who were busy in the forest. At about 1.30 p.m. the first shootings were heard coming from the forest. Needless to say the first group of 300 men did not return to the camp. They had been ordered to construct four wooden pyres in the forest glade. The platforms of the pyres were six by six and a half metres in dimension. 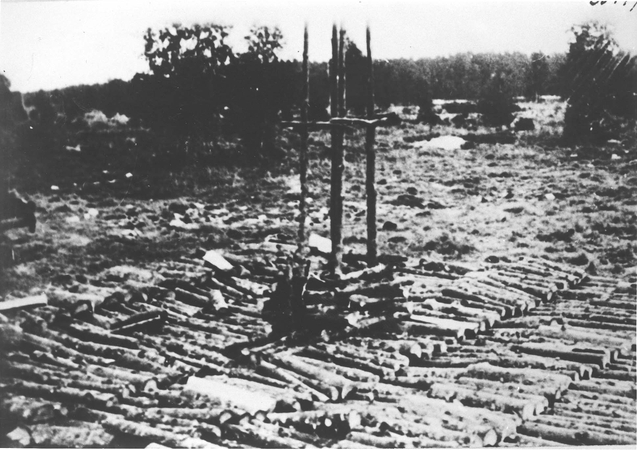 Each pyre consisted of a layer of logs and then planks on top of the logs with in the middle a sort of exhaust chimney . Each victim was ordered to take a log 75cm broad and lie down with their head on the log next to the previous victim. They were then shot in the nape of the neck. This formed a tight row of bodies on top of which a new layer of logs and prisoners was formed. In total there were three to four layers made on each pyre. At 4 p.m. six prisoners were ordered to load a truck with two barrels of fuel which was probably used later to burn the pyres. Then from 5 p.m. onwards groups of 50 to 100 prisoners at a time were taken to the glade in the forest. The pyres were set alight at about 8 p.m . The German SS commanders and guards and Estonian SS guards evacuated that night. A few days later the advancing Soviets liberated the camp. In total an estimated 1800 to 2000 prisoners died. Only 87 prisoners survived. 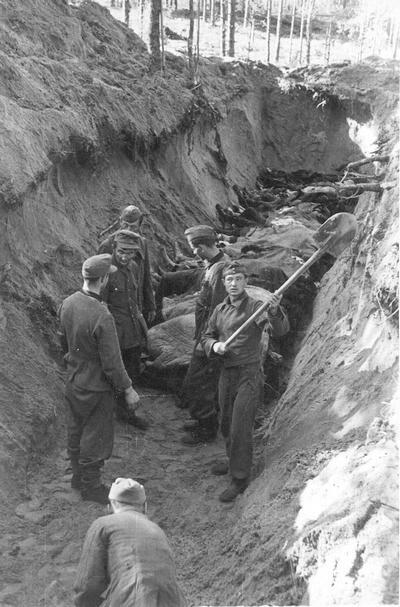 German prisoners of war were consigned by the Soviets to bury the victims in a mass grave. After walking from the site of the former camp to the killing ground I visited the mass grave, a few metres away. I placed a stone that I took from my garden in Holland and said Kaddish, the Jewish prayer for the dead, just as I had done in Ponar for Basia's next of kin. It was an unsettling feeling to leave Basia behind in the Estonian forest in the growing darkness of the late afternoon. Nevertheless I am glad to have been able to pay my respects to her and the other victims. The title of this page is a reference to the title of the article, "Prisoner 339, Klooga" in Life Magazine which was published on 30th October 1944. 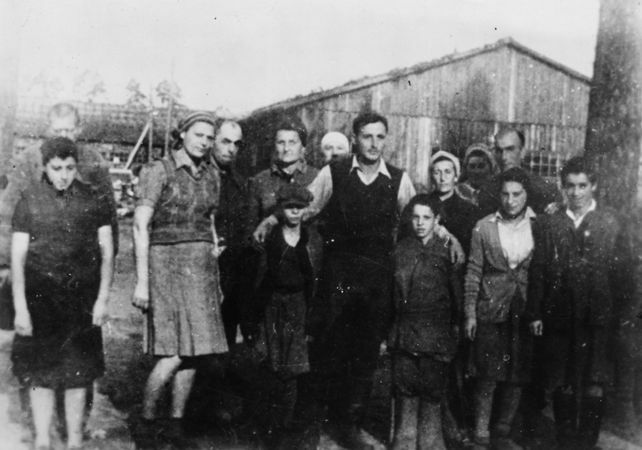 The article contained the eye-witness account of Klooga camp survivor, Benjamin Weintraub (pictured fourth from the left in the photograph of survivors above). 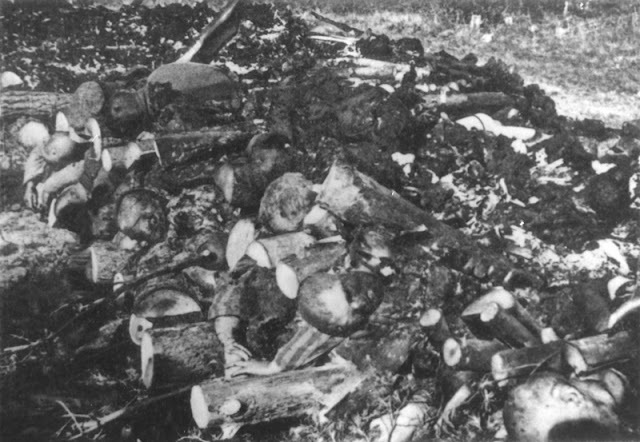 The massacre at Klooga was one of the first publicly documented atrocities committed by the Nazis in WWII[*]. It was a year before the liberation of Auschwitz and realising the importance of this event Stalin wrote to Churchill and told him to send journalists to take a look at something 'interesting'. The unwitting journalists arrived on 28th September 1944. Among them was not only the journalist of Life Magazine and reporters from other top Western newspapers but also the well-known author, Graham Greene who was reporting for The Times. For the first time the world was confronted with unequivocable photographic and filmed evidence of the Final Solution. [+] Vilna was part of Poland when Betty emmigrated to Scotland and therefore she is actually referring to the German invasion of Lithuania in 1941 and not the invasion of Poland in 1939. [*] This was not the first evidence however of the Holocaust. The Polish WWII resistance fighter, Jan Karski, reported to the US and British Governments on behalf of the Polish Government-in-Exile on 10th December 1942 in a report with the unambiguous title "The Mass Extermination of Jews in German Occupied Poland". Despite this report and despite even a personal interview with Franklin D. Roosevelt on 28th July 1943, Karski's account was laid aside and not explicitly acted upon . Donate and get a mention in the closing credits of the film! This project needs your help. If you would like to support the making of this film, please make a donation, no matter how large or small. Or if you wish to learn more about the aims of the project please click here. © Copyright Marco Riato. Travel theme. Powered by Blogger.